Many tall ships with homeports in the Northeast offer sail training programs for young people, ranging from marine science classes for elementary school kids to coastal voyages in New England and offshore passages to exotic locales for young adults. Here’s an overview of programs in our region (listed alphabetically), some of which also offer junior sailing instruction in small boats. 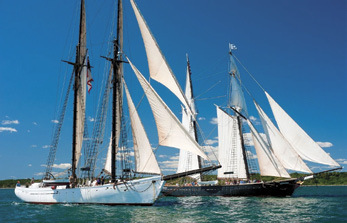 The Black Dog Tall Ships brings young people ages 9-16 onboard their schooners Alabama (120 feet) and Shenandoah (152 feet), exposing them to the joy of traditional sail through the popular Kids Cruise summer camps and Sailing School Program. In the Sailing School Program, these historic ships become interactive platforms for schools, classes and organizations. During their time onboard, students learn how to sail the ship through active participation led by the crew, and a special curriculum teaches core subjects including social studies, mathematics, science, language arts, music and art. Unlike traditional sail training, the six-day Kids Cruise summer camps focus on allowing the next generation of sailors to fully immerse themselves in shipboard life with the emphasis on fun. They become part of the crew, and with no modern conveniences they return to another time through the quiet sails, coal-fired stove, and hand water pumps. They rise early for deck swabbing, galley duty and hauling sails and anchor, sharing the camaraderie of the captain, crew, chaperones, and each other. Skills including basic seamanship, navigation, marlinspike rope work and small boat handling are taught, but the goal of each day is setting sail and cruising southeast New England’s pristine coast. Sailing dates for the 2014 Kids Cruise are July 13 (Writer’s Week), July 20, July 27 and August 3. No sailing experience is required, and there is a maximum of 30 passengers per week. The program is open to all 9 to 16 year olds, and the cost is $950 per passenger. To reserve a berth, call 508-693- 1699. More information is available at theblackdogtallships.com. The vision of the late folk music legend and environmental activist Pete Seeger to save his beloved Hudson River, the 106-foot Clearwater, a replica of the sloops that plied the river in the 18th and 19th centuries, was launched at Harvey Gamage Shipyard in South Bristol, ME in 1969. “America’s Environmental Flagship” has provided a first real look at estuarine ecology for more than half a million young people, many of whom had the good fortune to raise the sails and sing along with Pete, who passed on in January. Carrying on Seeger’s remarkable legacy of inspiring, teaching and activating the next generation of environmental leaders, the centerpiece of Hudson River Sloop Clearwater’s education program is the Sailing Classroom Program. 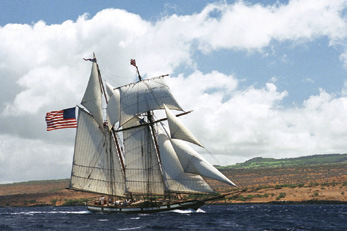 On a three- or five-hour sail onboard the Clearwater or the schooner Mystic Whaler (see below), students help raise the sails, navigate the boat, visit learning stations to examine river life, perform water quality tests, and study plankton and other invertebrate life under field magnification. The Sailing Classroom Programs are designed for school groups, camps, scout troops or community organizations and are appropriate for grades 4 to college. Sails for youth in grades 4 through high school can accommodate a maximum of 50 passengers, including all students, teachers and chaperones. 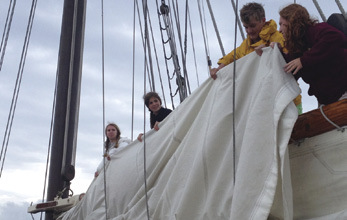 The Clearwater sails between New York City and Albany during the warmer months, introducing young people to the Hudson River and environmental education that can forge a connection with nature to last a lifetime. For more information on the sloop and Hudson River Sloop Clearwater’s programs and events, visit clearwater.org. Mystic Seaport offers 5- and 10-day cruises aboard the 61-foot schooner Brilliant for ages 15-18. the Brilliant Team program focuses on educating participants about sail handling and theory, teamwork, being a good shipmate, stewardship, navigation, and proper seamanship. Nine teenage participants work together under the guidance of the professional crew to safely sail hundreds of miles and learn traditional seamanship skills. All teens are expected to fully participate in all aspects of daily vessel operations from hauling on lines and steering to helping in the galley. Participants, who basically become crewmembers and actively sail the boat, must be physically fit and agile as well as competent swimmers. The voyages, which visit New England harbors and towns, depart from and return to Mystic Seaport without set destinations in between. The captain decides where to sail based on conditions, and participants sleep aboard the Brilliant each night. Once you reserve a berth, you will be sent a health form, letter of agreement, and a booklet of information outlining what to bring, arrival information, as well as many other details. No previous sailing experience is necessary. The 2014 Brilliant Teen program runs from June 16 to August 13. To register, call 860- 572-5322 or email reservations.desk@mysticseaport.org. For more information including sailing dates, visit mysticseaport.org/learn/sailing/brilliant-programs/teens. Mystic Seaport’s Anchor Watch is an overnight program for youth groups including scout troops and 4-H groups, with hands-on activities by day and sleeping aboard the 118-foot square-rigger Joseph Conrad by night. Visit mysticseaport.org for more information. 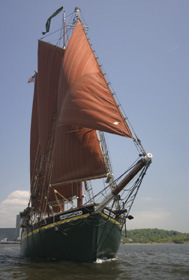 The 110-foot Mystic Whaler is a reproduction of a late 19th century gaff-rigged coastal cargo schooner. With a warm interior featuring Italian oak floors, fir wainscoting and mahogany accents, she sails from her homeport of New London, CT, giving adults and children over the age of five an opportunity to learn firsthand how to raise sail to a sea chantey and experience the thrill of turning the ship’s wooden wheel. Mystic Whaler Cruises offers several voyages from New London including day sails, lobster dinner cruises, 2-, 3- and 5-day cruises, and 5-day cruises in the Chesapeake. 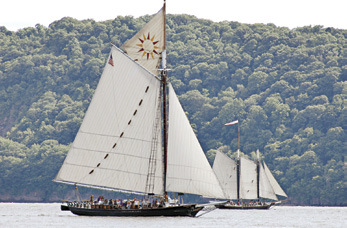 The Mystic Whaler Participates in the Great Chesapeake Bay Schooner Race each October, and frequently teams up with Hudson River Sloop Clearwater to offer educational cruises on the Hudson River. Visit mysticwhalercruises.com for more information. Ocean Classroom is an educational organization providing programs of sea education and adventure aboard their fleet of traditional schooners, including the Harvey Gamage, Virginia, Amistad, Spirit of Massachusetts, and Westward. Seafaring Camp and Advanced Seafaring Camp, middle school and high school students work alongside professional crew, standing watch, hauling halyards, hoisting sails, learning navigation, and steering the ship along the Atlantic Coast. 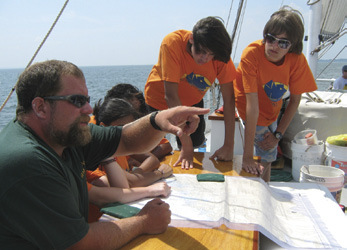 Seafaring Camp is a one-week co-educational learning adventure for ages 13-15, exploring the marine environment of coastal New England to discover the sea’s rich diversity of life, history, and lore. Led by the ship’s education officer, sailors observe whales, read and discuss maritime literature, visit historic sites and museums, and share sea songs and stories. Advanced Seafaring Camp takes the experience to the next level on a two-week voyage around the Gulf of Maine for ages 15-18. Twenty-one to 23 students sail each session with eight professional crewmembers and an educator. While aboard ship all meals, necessary equipment and education materials are provided. Sailors discover courage, confidence, and pride in their accomplishments and shared achievements as they work hard and make new friends on a magnificent ship. This summer Seafaring Camp will be held from July 26 to August 2, and Advanced Seafaring Camp from July 6 – 20. For more information, call 207-563-3566, email mail@oceanclassroom.org, or visit oceanclassroom.org. 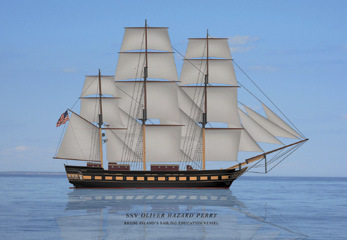 The 200-foot SSV Oliver Hazard Perry is the newest addition to America’s tall ship fleet. She is the first ocean-going civilian sail training vessel of her size to be built in the US in over 100 years, equipped with a 130-foot rig, 20 sails, and six miles of rigging. Although her design is based on centuries-old tradition, her equipment is anything but antiquated. Apart from her state-of-the-art science lab, designed under the guidance of the University of Rhode Island’s Graduate School of Oceanography, she has wheelchair accessible staterooms, a wheelchair lift, a modern galley, interactive smart boards, wellstocked library and high-end navigation systems. Above decks, however, she’s a completely traditional tall ship that requires full crew participation. Everyone who sails aboard the Perry is a crewmember; under the guidance of 15 professionals, all hands are required to sail this magnificent ship. The ship’s first trips will begin this summer as one-week camp sessions in August, and students ages 13-18 are invited aboard as shipmates. Campers will become part of the crew and participate in all aspects of life aboard as they learn to hoist and brace the yards, steer, navigate, and run the ship together. Lasting friendships, leadership skills, and teamwork are highlighted on these voyages as the SSV Oliver Hazard Perry travels along the coast of New England, Newport, Nantucket, Boston, Portsmouth and Greenport are among the historically rich ports the ship will visit. In addition, they will witness the natural magic of the ocean and its inhabitants – think spectacular night skies, marine phosphorescence, whales breaching, and dolphins at play! Bunk space is available for 34 campers, and the camp price for six days/nights is $1,600, which includes all meals, seamanship instruction and training. For more information, dates and schedule, visit ohpri.org or contact Jess Wurzbacher or Elise Huebner at 401-841-0080 or info@ohpri.org. The 176-foot, three-masted barque Picton Castle is on the other side of the world this summer, sailing the waters of the exotic South Pacific, then around the world on her sixth global circumnavigation. A new voyage begins on July 1, 2014 in Fiji. While many of the trainee crew will sign on for the full voyage, some will come aboard for one or more legs. If you’ve been considering a gap year, this is the ultimate adventure. Ports of call on the Pincton Castle Westward Bound Voyage 2014-2015 include Fiji, Bali, Cape Town, Cape Verde and Savannah, GA.
Everyone aboard the Pincton Castle is a working crewmember. Trainees are fully involved in all aspects of sailing the ship, under the guidance of the professional crew. You will take your turn at the helm and on lookout, haul on lines to set and take in sails, assist with ship’s maintenance and climb aloft in the rigging (optional). Through hands-on training and workshops, you’ll learn traditional seamanship skills while sailing as part of an international crew on an epic voyage. The Westward Bound Voyage is open to men and women ages 18 and up. No sailing experience is necessary – just good health, physical fitness and a strong desire to be part of the crew. For more information, visit picton-castle.com, email info@picton-castle.com or call 902-634 9984. 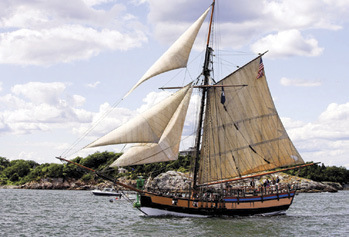 Launched in 2001 in Rockport, ME, Lynx is an interpretation of an actual privateer named Lynx built for the War of 1812. This 122-foot square topsail schooner was among the first ships to defend American freedom by evading the British naval fleet, blockading American ports, and serving in vital privateering efforts. “America’s Privateer” sails from her homeport of Portsmouth, NH. The interactive Lynx Educational Program, available for 5th-8th graders, enlightens, challenges and inspires students to think, absorb, retain and work as a team. In addition, it provides teachers a solid medium to capture kids’ imagination, focus their attention and put the history lessons of this beautiful country’s defense into perspective. In the Dockside Curriculum, students participate in a 1.5- hour lesson aboard the ship, dockside in Portsmouth, learning the skills of a sailor, hoisting a sail, touring the ship, and getting a taste of 19th century maritime history. Lessons are taught from the perspective of a privateer crew, focusing on the integral roles they played. In the 3-hour Sailing Curriculum, students join a watch, hoist the sails, steer the ship, sing chanteys, and become part of the crew. For more information, visit privateerlynx.com. Schooner Inc, owns and operates the schooner Quinnipiack the flagship of New Haven, CT. Their mission is to promote environmental literacy and character development through education and public access to Long Island Sound and its watershed. Since 1975, they have run programs (mostly on the water) to fulfill this mission and will celebrate their 40th birthday in 2015 with a Waterfront Renewal Project. During the summer, Schooner Inc offers sailing programs onboard the 91-foot Quinnipiack for youth in grades 5-6 as well as small boat sailing programs (Sail New Haven) for grades 4-6 on their fleet of Laser Funboats and for grades 7-12 on their fleet of Picos. These weekday programs on New Haven Harbor are part of their summer SEA Camps. Aboard the “Quinni” students in the Adventurers camp learn to work as a part of the crew while learning about the maritime skills (navigation, etc) and marine science (plankton, benthos, etc) that are a part of a well-rounded mariner’s repertoire. Schooner also offers shoreline exploration camps for children entering grades pre-K-4, as well as a kayak program for grades 7-12. Scholarships are available for families with financial need. For more information, contact Kristen Seda at camp@schoonerinc.org or visit schoonerinc.org. 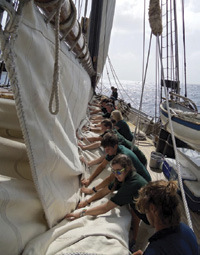 Sisters Under Sail is a one-of-a-kind leadership program for teenage girls. Sisters Under Sail’s all-women crew has a passion for sailing and teaching. All that’s required of participants is a willingness to try and the courage to stretch oneself. It takes a team to sail a big tall ship, and participants handle all shipboard duties from cooking and cleaning to setting and trimming sails, navigating and steering, exceeding their own perceived abilities as they embark on voyages of self-discovery and personal growth on the waters of the Northeast, Chesapeake and beyond. The Sisters Under Sail curriculum is purposefully built to capitalize on the lessons learned while students are sailing onboard a traditionally rigged tall ship. The program establishes a safe environment for young women where they are free to explore, learn and challenge themselves. The 110-foot square topsail gaff-rigged schooner Unicorn has sailed as the Sisters Under Sail flagship for many years, although the organization as chartered the 137-foot schooner Denis Sullivan, the Flagship of Wisconsin for a one-week program on Lake Michigan this summer. All berths, however, are sold out. For information on upcoming programs, visit sistersundersail.org. 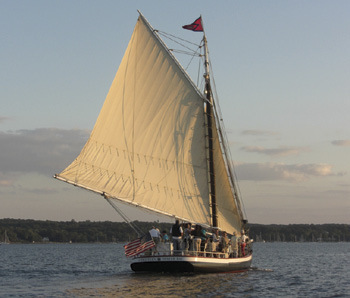 The three-masted, 80-foot Schooner SoundWaters is the Teaching Vessel of Long Island Sound. Owned and operated by a non-profit organization of the same name, this replica of a 17th century schooner serves as a floating classroom for school children. Sailing from April to November on Long Island Sound with a U.S. Coast Guard-certified captain, live-aboard mate and four deckhand marine science educators, Sound Waters is the platform for Science of the Sound, a hands-on, science-infused learning experience. During this three-hour science enrichment program, students will help to raise the sails, haul in a trawl net and examine the Sound’s ecology. The program provides an interactive learning experience that cannot be simulated in a classroom, reinforcing many of the ecological concepts and theories introduced throughout SoundWaters education programs. The Science of the Sound program embodies the standards for Connecticut and New York Core Science Curriculum Frameworks and prepares students for the States’ Mastery Tests. Log onto soundwaters.org to learn more. Rhode Island’s Official Flagship and Sailing Ambassador, the 110-foot square topsail sloop Providence is a faithful replica of John Paul Jones’ first command, the first ship commissioned into the Continental Navy. During her distinguished naval career, the original 12-gun Providence sank or captured 40 British enemy ships. 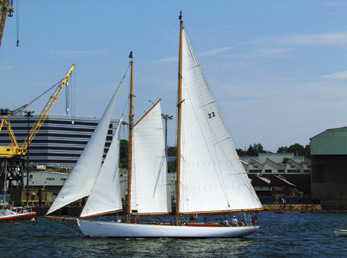 Built in Portsmouth, RI in 1975 for the bicentennial, Providence is available forsail training and school field trips. 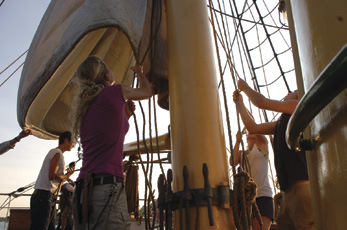 From one-day sails to weeklong experiences, students learn not only basic sailing techniques but also the ways of a tall ship from every angle of the ship. Educators are invited to design customized field trips for their classes, with a focus on American maritime history, historical reenactment, ocean ecological conservation programming, or a variety of other options. Log onto tallshipprovidence.com for more details. Providing waterfront access to education and recreation for kids and adults, The WaterFront Center teaches people to become active stewards of the marine environment while enjoying the waters of Oyster Bay. Their flagship, Christeen is a 60-foot gaff rigged sloop. Built in 1883, she is the oldest oyster sloop in America and a National Historic Landmark. Relaunched in 1999 after a complete restoration, Christeen’s now serves as a floating classroom. Her Coast Guard certified captains and experienced crew educate passengers about maritime history, marine science, coastal ecology, the oyster industry and aquaculture. The WaterFront Center offers customized group excursions for camps, yacht clubs, day care programs, boys and girls clubs, and other youth groups. In addition to sailing Oyster Bay aboard Christeen, these outings can include other activities including sailing on a Sonar or paddling kayaks and standup paddleboards. Visit thewaterfrontcenter.org for more information.